Should Low Central Venous Pressure Be Maintained during Liver Transplantation? Low central venous pressure, which indirectly reflects free hepatic venous pressure, is maintained during hepatic resection surgery to reduce intraoperative blood loss by facilitating hepatic venous outflow. However, whether the low central venous pressure protocol established for non-transplant hepatobiliary surgery should be generalized to liver transplantation is controversial because patients with cirrhosis have decreased portal and hepatic venous blood flow and vulnerability to renal failure. However, consistent with observations from hepatic resection surgeries, lowering central venous pressure during the preanhepatic phase significantly reduces blood loss and transfusion volume. Conversely, inherent study limitations and different study designs have yielded different results in terms of renal dysfunction. Although hepatic venous outflow promoted by lowering blood volume seems to facilitate a liver graft to accommodate portal blood flow increased by portal hypertension-induced splanchnic vasodilatation, the association between low central venous pressure and reduced incidence of portal hyperperfusion injury has not been demonstrated. Stroke volume variation predicts fluid responsiveness better than central venous pressure, but it has not been associated with a greater clinical benefit than central venous pressure to date. Therefore, the safety of maintaining low central venous pressure during liver transplantation has not been verified, and further randomized controlled studies are warranted to establish a fluid management protocol for each phase of liver transplantation to reduce intraoperative blood loss and transfusion rate, thereby maintaining liver graft viability. In conclusion, low central venous pressure reduces intraoperative blood loss but does not guarantee renoprotection or graft protection. Keywords: Blood loss, Central venous pressure, Liver transplantation, Portal hypertension, Splanchnic circulation, Stroke volume. © 2017 Jong Hae Kim. Maintenance of low central venous pressure has been advocated for hepatic resection surgery because it facilitates hepatic venous outflow, which decreases the resistance of blood flow from the hepatic venous system into the inferior vena cava and prevents hepatic congestion, thereby decreasing bleeding from the sinusoids or hepatic veins during surgery [1Huntington JT, Royall NA, Schmidt CR. Minimizing blood loss during hepatectomy: a literature review. J Surg Oncol 2014; 109(2): 81-8. [http://dx.doi.org/10.1002/jso.23455] [PMID: 24449171] ]. Based on this mechanism, several methods for maintaining low central venous pressure during liver transplantation have been reported, with non-uniform results [2Feng ZY, Xu X, Zhu SM, Bein B, Zheng SS. Effects of low central venous pressure during preanhepatic phase on blood loss and liver and renal function in liver transplantation. World J Surg 2010; 34(8): 1864-73. [10.1007/s00268-010-0544-y]. [PMID: 20372900]. [http://dx.doi.org/10.1007/s00268-010-0544-y] [PMID: 20372900] -5Schroeder RA, Collins BH, Tuttle-Newhall E, et al. Intraoperative fluid management during orthotopic liver transplantation. J Cardiothorac Vasc Anesth 2004; 18(4): 438-41. [http://dx.doi.org/10.1053/j.jvca.2004.05.020] [PMID: 15365923] ]. Hence, whether to generalize the protocol used for non-transplant hepatobiliary surgery to liver transplantation has been addressed based on different physiological factors with respect to the liver [6Schroeder RA, Kuo PC. Pro: low central venous pressure during liver transplantation not too low. J Cardiothorac Vasc Anesth 2008; 22(2): 311-4. [http://dx.doi.org/10.1053/j.jvca.2007.12.009] [PMID: 18375341] ]. Recently, an optimal range of central venous pressure during the neohepatic phase was suggested to reduce portal hyperperfusion following liver graft reperfusion; notably, this range would not be considered low compared to the central venous pressure levels that have been maintained in previous studies. Such portal hyperperfusion occurs due to the persistent hyperdynamic splanchnic circulation that is present in patients with cirrhosis who undergo liver transplantation and is complicated by portal hypertension [7Ryu TH, Jung JY, Choi DL, Han YS, Kim JD, Kim JH. Optimal central venous pressure during the neohepatic phase to decrease peak portal vein flow velocity for the prevention of portal hyperperfusion in patients undergoing living donor liver transplantation. Transplant Proc 2015; 47(4): 1194-8. [http://dx.doi.org/10.1016/j.transproceed.2014.10.071] [PMID: 26036552] ]. In addition, accumulating evidence has shown the superiority of stroke volume variation compared to central venous pressure in terms of assessing fluid responsiveness in patients undergoing liver transplantation [8Biais M, Nouette-Gaulain K, Quinart A, Roullet S, Revel P, Sztark F. Uncalibrated stroke volume variations are able to predict the hemodynamic effects of positive end-expiratory pressure in patients with acute lung injury or acute respiratory distress syndrome after liver transplantation. Anesthesiology 2009; 111(4): 855-62. [http://dx.doi.org/10.1097/ALN.0b013e3181b27fb2] [PMID: 19741498] -11Wang SC, Teng WN, Chang KY, et al. Fluid management guided by stroke volume variation failed to decrease the incidence of acute kidney injury, 30-day mortality, and 1-year survival in living donor liver transplant recipients. J Chin Med Assoc 2012; 75(12): 654-9. [10.1016/j.jcma.2012.08.007]. [PMID: 23245482]. cirrhosis pathophysiology, and results from previous studies. After the induction of anesthesia for liver transplantation, the subclavian or internal jugular veins are frequently catheterized and sometimes the femoral vein is also catheterized. A central venous catheter tip is generally inserted via the subclavian or internal jugular vein at the junction of the right atrium and superior vena cava or in the lower third of the superior vena cava [12Vesely TM. Central venous catheter tip position: a continuing controversy. J Vasc Interv Radiol 2003; 14(5): 527-34. [PMID: 12761305]. [http://dx.doi.org/10.1097/01.RVI.0000071097.76348.72] [PMID: 12761305] ]. The pressure measured from the tip of this catheter is considered the central venous pressure and is a key physiologic estimate of preload, which can help determine intravascular fluid status. Central venous pressure also reflects free hepatic venous pressure because the hepatic veins lie within 0.5 to 3.0 cm of the ostium of the right atrium [13Ommen SR, Nishimura RA, Hurrell DG, Klarich KW. Assessment of right atrial pressure with 2-dimensional and Doppler echocardiography: a simultaneous catheterization and echocardiographic study. Mayo Clin Proc 2000; 75(1): 24-9. [10.4065/75.1.24]. [PMID: 10630753]. [http://dx.doi.org/10.4065/75.1.24] [PMID: 10630753] ]. In addition, no significant anatomical structure prevents the patency from the hepatic veins to the lower portion of the superior vena cava. Although a Eustachian valve originating from the inferior vena cava orifice can exist, it does not influence the venous flow from the inferior vena cava to the right atrium, except for in rare extreme cases [14Rossall RE, Caldwell RA. Obstruction of inferior vena cava by a persistent eustachian valve in a young adult. J Clin Pathol 1957; 10(1): 40-5. [PMID: 13406072]. [http://dx.doi.org/10.1136/jcp.10.1.40] [PMID: 13406072] ]. Unless there is a positional change, such as head-down or head-up tilt, the consistency between central venous pressure and free hepatic venous pressure is not influenced by positive end-expiratory pressure [15Sand L, Rizell M, Houltz E, et al. Effect of patient position and PEEP on hepatic, portal and central venous pressures during liver resection. 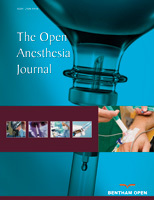 Acta Anaesthesiol Scand 2011; 55(9): 1106-12. [http://dx.doi.org/10.1111/j.1399-6576.2011.02502.x] [PMID: 22092208] ]. Moreover, central venous pressure has a linear relationship with portal venous pressure [16Sainz-Barriga M, Scudeller L, Costa MG, de Hemptinne B, Troisi RI. Lack of a correlation between portal vein flow and pressure: toward a shared interpretation of hemodynamic stress governing inflow modulation in liver transplantation. Liver Transpl 2011; 17(7): 836-48. [http://dx.doi.org/10.1002/lt.22295] [PMID: 21384528] , 17Laine GA, Hall JT, Laine SH, Granger J. Transsinusoidal fluid dynamics in canine liver during venous hypertension. Circ Res 1979; 45(3): 317-23. However, when the tip of a catheter is placed through the femoral vein, it usually does not reach the inferior vena cava. As such, there is a longer distance between the catheter tip and the hepatic veins than when a catheter tip is introduced from the subclavian or internal jugular vein. In addition, because there is a greater dynamic pressure gradient between the hepatic veins and femoral veins than that between the hepatic veins and superior vena cava [18Meissner MH, Moneta G, Burnand K, et al. The hemodynamics and diagnosis of venous disease. J Vasc Surg 2007; 46(4S2-4S). ], inaccuracy can arise when using a catheter inserted from the femoral vein for the indirect measurement of free hepatic venous pressure. Furthermore, the pressure measured from the catheter tip is affected by manipulation of the liver and total or partial clamping of the infrahepatic inferior vena cava, which can impede venous return from the infrahepatic inferior vena cava or hepatic veins to the right atrium, resulting in increased pressure (Fig. 1 ). Therefore, measurements of central venous pressure from the superior vena cava or the junction of the right atrium and superior vena cava indirectly reflect free hepatic venous pressure and can help clinicians assess resistance to hepatic venous outflow. Trends of the central venous pressure measured from the internal jugular and femoral veins during living donor liver transplantation using temporary portocaval shunt. The liver is perfused by the hepatic artery and portal vein and is drained by the hepatic veins. The pressure gradient between the inflow and outflow of the liver (i.e., the hepatic venous pressure gradient) is 1 to 5 mmHg [19Kumar A, Sharma P, Sarin SK. Hepatic venous pressure gradient measurement: time to learn! Indian J Gastroenterol 2008; 27(2): 74-80. [PMID: 18695309] ]. In a cirrhotic liver, an increase in portal tract extracellular matrix with sclerosis around the portal veins increases presinusoidal vascular resistance. The development of abnormal hepatic artery-to-portal vein shunts results in an increase in portal venous pressure (Fig. 2 ). In the sinusoids, the endothelial fenestrae are lost with the development of the basal lamina and the expansion of fibrosis in the space of Disse, leading to an increase in sinusoidal resistance (Fig. 3 ). 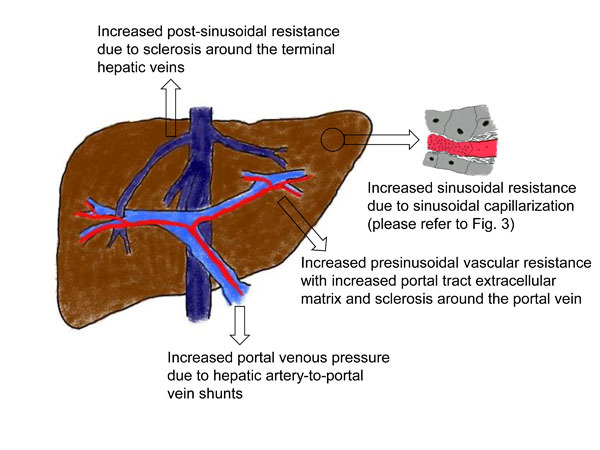 Increased post-sinusoidal resistance due to sclerosis around the terminal hepatic veins impedes the outflow of sinusoidal blood (Fig. 2 ). The net results of the impaired hepatic blood flow through the liver parenchyma are portal hypertension, characterized by an increased hepatic venous pressure gradient of more than 5 mmHg [20Bloom S, Kemp W, Lubel J. Portal hypertension: pathophysiology, diagnosis and management. Intern Med J 2015; 45(1): 16-26. [10.1111/imj.12590]. [PMID: 25230084]. [http://dx.doi.org/10.1111/imj.12590] [PMID: 25230084] ]; subsequent development of esophageal varices; and rupture of these varices [21Garcia-Tsao G, Groszmann RJ, Fisher RL, Conn HO, Atterbury CE, Glickman M. Portal pressure, presence of gastroesophageal varices and variceal bleeding. Hepatology 1985; 5(3): 419-24. [PMID: 3873388]. [http://dx.doi.org/10.1002/hep.1840050313] [PMID: 3873388] ]. In accordance with the above pathophysiology, hepatic venous outflow is also reduced [22Bauer LA, OSullivan T, Reiss WG, et al. Liver blood flow, antipyrine clearance, and antipyrine metabolite formation clearance in patients with chronic active hepatitis and alcoholic cirrhosis. Br J Clin Pharmacol 1994; 37(4): 375-81. [http://dx.doi.org/10.1111/j.1365-2125.1994.tb04292.x] [PMID: 8018459] , 23Wei A, Chen H, Liu L, Wang K. Changes in portal vein and hepatic vein blood flow volume and their ratio in SD rats during induced carcinogenesis of hepatocellular carcinoma. Nan Fang Yi Ke Da Xue Xue Bao 2015; 35(3): 442-5. Alterations in hepatic hemodynamics in a cirrhotic liver. Hence, the additive or synergistic effects of the reduced hepatic venous outflow and lowering central venous pressure which promotes uninterrupted hepatic venous outflow would be expected during liver transplantation for the treatment of liver cirrhosis. During a hepatectomy, surgeons often resect a physiologically functioning liver with intact hepatic venous outflow. In this context, lowering central venous pressure has a beneficial effect on intraoperative blood loss due to the facilitation of hepatic venous outflow and the consequent prevention of hepatic congestion [24Chen H, Merchant NB, Didolkar MS. Hepatic resection using intermittent vascular inflow occlusion and low central venous pressure anesthesia improves morbidity and mortality. J Gastrointest Surg 2000; 4(2): 162-7. [http://dx.doi.org/10.1016/S1091-255X(00)80052-9] [PMID: 10675239] -28Balci ST, Pirat A, Torgay A, Cinar O, Sevmis S, Arslan G. Effect of restrictive fluid management and acute normovolemic intraoperative hemodilution on transfusion requirements during living donor hepatectomy. Transplant Proc 2008; 40(1): 224-7. [http://dx.doi.org/10.1016/j.transproceed.2007.12.011] [PMID: 18261592] ]. However, one concern regarding the maintenance of low central venous pressure in patients with cirrhosis who are undergoing liver transplantation is associated with the proneness of such patients to renal failure due to hypovolemia, which can be induced by a decrease in central venous pressure. The potential for this relationship exists due to such patients’ underlying medical conditions, which can include circulatory dysfunction with arterial underfilling, increased endogenous vasoconstrictor activity that affects intra-renal circulation, and increased systemic inflammatory responses [29Ginès P, Schrier RW. Renal failure in cirrhosis. N Engl J Med 2009; 361(13): 1279-90. Sinusoidal capillarization contributing to an increase in sinusoidal resistance in a cirrhotic liver (modified from Crawford and Burt [65Crawford JM, Burt AD. Anatomy, pathophysiology and basic mechanisms of disease. In: Burt AD, Portmann BC, Ferrell LD, Eds. 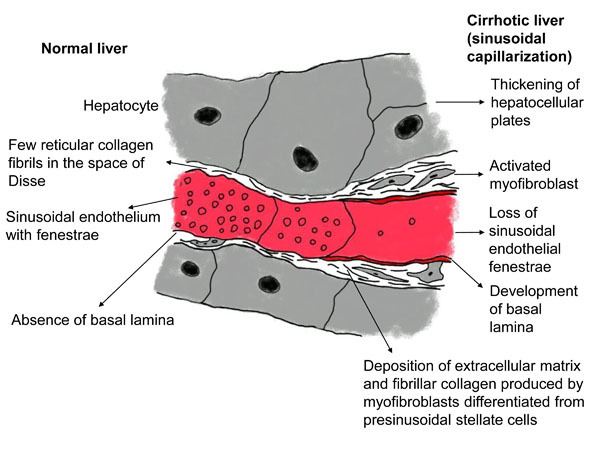 MacSween's Pathology of the Liver. Philadelphia: Churchill Livingstone Elsevier 2012; pp. 1-77. Notwithstanding the risk for renal failure, a low central venous pressure protocol has been used in several studies of liver transplantation (Table 1). PubMed, EMBASE, and Cochrane library were searched for the studies relevant to this review published in English from 2000 to August 2016, using the Medical Subject Headings which were central venous pressure and liver transplantation. Studies that investigated the clinical outcomes of central venous pressure maintained low during liver transplantation in adult patients were included. Since there were only a few prospective studies, retrospective studies were also included in this review. Then, data were abstracted on study design, sample size per group, target range and strategies for low central venous pressure, clinical outcomes, and study limitations. The first published retrospective study showed that patients undergoing liver transplant whose central venous pressure was maintained below 5 mmHg during the preanhepatic (before total hepatectomy of the native liver) and neohepatic (after reperfusion of the liver graft) phases and as low as possible during the anhepatic phase (when vascular anastomoses of the liver graft are performed) by minimal administration of fluid and use of alpha-agonists (phenylephrine or norepinephrine), venodilators (nitroglycerin), morphine, and furosemide, were transfused less than patients whose central venous pressure was maintained at normal levels. However, the former group of patients required more postoperative dialysis, showed higher levels of peak creatinine and had a higher 30-day mortality rate [5Schroeder RA, Collins BH, Tuttle-Newhall E, et al. Intraoperative fluid management during orthotopic liver transplantation. J Cardiothorac Vasc Anesth 2004; 18(4): 438-41. [http://dx.doi.org/10.1053/j.jvca.2004.05.020] [PMID: 15365923] ]. Notably, in the referenced study, two different protocols (low central venous pressure versus normal central venous pressure) were employed in two different medical centers, and the preoperative medical status of the normal central venous pressure group was poorer than that of the low central venous pressure group. Hence, a clear conclusion could not be drawn. A few years later, contrasting results were produced in another study, in which a 40% decrease in baseline central venous pressure caused by restriction of fluid infusion and/or phlebotomy without volume replacement during the preanhepatic phase reduced transfusion quantity without causing a significant difference in serum creatinine value on the 5th postoperative day or in 1-year mortality [4Massicotte L, Lenis S, Thibeault L, Sassine MP, Seal RF, Roy A. Effect of low central venous pressure and phlebotomy on blood product transfusion requirements during liver transplantations. Liver Transpl 2006; 12(1): 117-23. [http://dx.doi.org/10.1002/lt.20559] [PMID: 16382461] ]. Later, more subjects were recruited for the low central venous pressure group, and the results became more favorable. Specifically, the low central venous pressure group had significantly lower serum creatinine levels 1 year after liver transplantation compared to the control group [3Massicotte L, Beaulieu D, Thibeault L. Con: low central venous pressure during liver transplantation. J Cardiothorac Vasc Anesth 2008; 22(2): 315-7. [http://dx.doi.org/10.1053/j.jvca.2008.01.001] [PMID: 18375342] ]. A limitation of the referenced study is that the control group data were obtained retrospectively, whereas the low central venous pressure group data were collected prospectively. In addition, the average duration of surgery was approximately 255 minutes because the surgeons were considerably proficient, indicating that a low central venous pressure protocol should be used with caution in transplant centers that have not reached a learning curve plateau. In a recent prospective randomized controlled study [2Feng ZY, Xu X, Zhu SM, Bein B, Zheng SS. Effects of low central venous pressure during preanhepatic phase on blood loss and liver and renal function in liver transplantation. World J Surg 2010; 34(8): 1864-73. [10.1007/s00268-010-0544-y]. [PMID: 20372900]. [http://dx.doi.org/10.1007/s00268-010-0544-y] [PMID: 20372900] ], central venous pressure was reduced to below 5 mmHg or by 40% of the baseline value during the preanhepatic phase by minimizing infusion volume, adjusting posture with a head-up tilt, and administering somatostatin and nitroglycerin. This low central venous pressure resulted in significant decreases in blood loss and transfusion quantity, as well as lower lactate levels at the end of surgery and better preservation of hepatic function after liver graft reperfusion. Furthermore, no significant differences in renal function or incidence of postoperative complications were observed between the treatment groups. In another prospective randomized controlled parallel study [30Wang B, He HK, Cheng B, Wei K, Min S. Effect of low central venous pressure on postoperative pulmonary complications in patients undergoing liver transplantation. Surg Today 2013; 43(7): 777-81. [http://dx.doi.org/10.1007/s00595-012-0419-y] [PMID: 23238884] ], maintenance of central venous pressure below 5 mmHg or lower than the baseline by about 40% by the Trendelenberg position, limiting infusion volume, and administration of nitroglycerine and furosemide also reduced the amount of intraoperative blood loss and transfusion. Interestingly, the low central venous pressure decreased the incidence of postoperative pulmonary complications (i.e., pleural effusion, pulmonary infection, and pulmonary edema) as well as mechanical ventilation time. In addition, the total urine volume was comparable between the 2 groups (low central venous pressure and control groups). The effects of maintaining low central venous pressure during liver transplantation on clinical outcomes. When a liver graft is reperfused, impaired portal venous blood flow is restored. After reperfusion, a liver graft should accommodate portal venous blood flow, which was already increased (portal hyperperfusion) due to persistent hyperdynamic splanchnic circulation caused by portal hypertension-induced splanchnic vasodilatation and subsequent development of extensive collaterals [31Vorobioff J, Bredfeldt JE, Groszmann RJ. Increased blood flow through the portal system in cirrhotic rats. Gastroenterology 1984; 87(5): 1120-6. [PMID: 6479534] ]. Theoretically, if hepatic venous outflow is impaired for any reason, including increased intravascular volume (represented by a high central venous pressure level), then portal hyperperfusion injury would develop and deteriorate. However, a recent retrospective study showed no significant difference in overall patient survival, graft survival or length of intensive care unit and hospital stay between two groups whose central venous pressures were maintained either below 10 mmHg or above 10 mmHg during the neohepatic phase [32Cywinski JB, Mascha E, You J, et al. Central venous pressure during the post-anhepatic phase is not associated with early postoperative outcomes following orthotopic liver transplantation. Minerva Anestesiol 2010; 76(10): 795-804. [PMID: 20935615] ]. Concordant with these results, the maintenance of a central venous pressure between 5 to 10.5 mmHg, which is not as low as the central venous pressure that has been maintained in previous studies, after liver graft reperfusion was found to prevent portal hyperperfusion in the early postoperative period [7Ryu TH, Jung JY, Choi DL, Han YS, Kim JD, Kim JH. 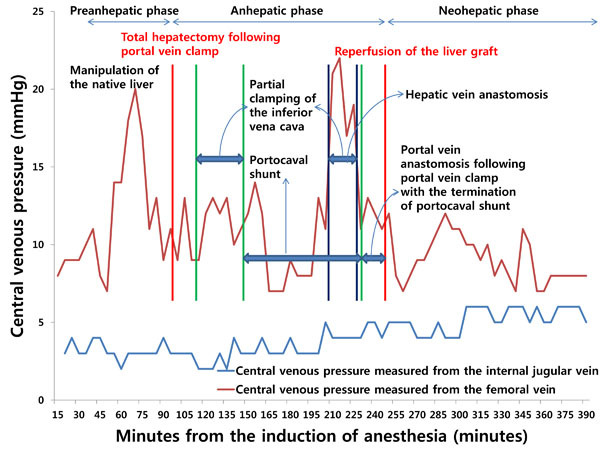 Optimal central venous pressure during the neohepatic phase to decrease peak portal vein flow velocity for the prevention of portal hyperperfusion in patients undergoing living donor liver transplantation. Transplant Proc 2015; 47(4): 1194-8. In summary, the use of a low central venous pressure protocol during the preanhepatic phase reduces blood loss and improves transfusion rate, but the effects of this approach on renal complications remain controversial. Despite the potential for portal hyperperfusion injury due to impaired hepatic venous outflow arising from high blood volume, which is represented by high central venous pressure, the maintenance of low central venous pressure during the neohepatic phase does not seem to enhance graft protection. Because various intraoperative events, such as hemodynamic instability, volume loss, and hemorrhage, contribute to the occurrence of postoperative acute kidney injury [33Hilmi IA, Damian D, Al-Khafaji A, et al. Acute kidney injury following orthotopic liver transplantation: incidence, risk factors, and effects on patient and graft outcomes. Br J Anaesth 2015; 114(6): 919-26. [http://dx.doi.org/10.1093/bja/aeu556] [PMID: 25673576] , 34Cabezuelo JB, Ramírez P, Ríos A, et al. Risk factors of acute renal failure after liver transplantation. Kidney Int 2006; 69(6): 1073-80. [http://dx.doi.org/10.1038/sj.ki.5000216] [PMID: 16528257] ], diagnosis of acute kidney injury and renal protection are considerably challenging during liver transplantation. Furthermore, there is a lack of substantial data on perioperative renal protective strategies [35Zacharias M, Mugawar M, Herbison GP, et al. Interventions for protecting renal function in the perioperative period. Cochrane Database Syst Rev 2013; (9): CD003590. [PMID: 24027097] ]. Compared to the renal dose of dopamine (2 – 3 µg/kg/min), fenoldopam 0.1 µg/kg/min administered for 2 or 4 days from anesthesia induction reduced the postoperative increase rates of serum creatinine and blood urea nitrogen and frequency of furosemide use [36Della RG, Pompei L, Costa MG, et al. Fenoldopam mesylate and renal function in patients undergoing liver transplantation: A randomized, controlled pilot trial. Anesth Analg 2004; 99(6): 1604-9. [http://dx.doi.org/10.1213/01.ANE.0000136420.01393.81] [PMID: 15562040] ] and maintained creatinine clearance rate unchanged [37Biancofiore G, Della RG, Bindi L, et al. Use of fenoldopam to control renal dysfunction early after liver transplantation. Liver Transpl 2004; 10(8): 986-92. [http://dx.doi.org/10.1002/lt.20145] [PMID: 15390323] ]. On the contrary, N-acetylcysteine failed to reduce the incidence of postoperative acute kidney injury [38Hilmi IA, Peng Z, Planinsic RM, et al. N-acetylcysteine does not prevent hepatorenal ischaemia-reperfusion injury in patients undergoing orthotopic liver transplantation. Nephrol Dial Transplant 2010; 25(7): 2328-33. [http://dx.doi.org/10.1093/ndt/gfq077] [PMID: 20179007] ]. Although equivalent renoprotective effects were shown between hydroxyethyl starch and human albumin in a prospective randomized study [39Mukhtar A, Aboulfetouh F, Obayah G, et al. The safety of modern hydroxyethyl starch in living donor liver transplantation: A comparison with human albumin. Anesth Analg 2009; 109(3): 924-30. [http://dx.doi.org/10.1213/ane.0b013e3181aed54f] [PMID: 19690268] ], a recent retrospective study demonstrated the association of the use of hydroxyethyl starch with the development of acute kidney injury [40Hand WR, Whiteley JR, Epperson TI, et al. Hydroxyethyl starch and acute kidney injury in orthotopic liver transplantation: a single-center retrospective review. Anesth Analg 2015; 120(3): 619-26. [http://dx.doi.org/10.1213/ANE.0000000000000374] [PMID: 25036375] ]. In addition, osmotic-nephrosis-like lesions of the distal and proximal tubules were observed up to 10 years after the use of hydroxyethyl starch during liver transplantation [41Pillebout E, Nochy D, Hill G, et al. Renal histopathological lesions after orthotopic liver transplantation (OLT). Am J Transplant 2005; 5(5): 1120-9. [http://dx.doi.org/10.1111/j.1600-6143.2005.00852.x] [PMID: 15816895] ]. Moreover, a black box warning for hydroxyethyl starch use in critically ill patients including liver transplantation recipients was issued by the United States Food and Drug Administration. Chloride-liberal fluids, such as 0.9% saline and 5% albumin, were found to be more associated with an increased risk for postoperative acute kidney injury, than with chloride-restrictive fluids, such as 0.45% saline and Ringer’s lactate [42Nadeem A, Salahuddin N, El Hazmi A, et al. Chloride-liberal fluids are associated with acute kidney injury after liver transplantation. Crit Care 2014; 18(6): 625. The incidence of acute kidney injury was higher in patients undergoing conventional technique (total occlusion of the inferior vena cava with or without venovenous bypass) than in those undergoing piggyback technique (62% in conventional technique group without venovenous bypass versus 18% in piggyback technique group [P = 0.001] [43Niemann CU, Walia A, Waldman J, et al. Acute kidney injury during liver transplantation as determined by neutrophil gelatinase-associated lipocalin. Liver Transpl 2009; 15(12): 1852-60. [http://dx.doi.org/10.1002/lt.21938] [PMID: 19938135] ]; 21% in conventional technique group using venovenous bypass versus 0% in piggyback technique group [P < 0.05] [44Jovine E, Mazziotti A, Grazi GL, et al. Piggy-back versus conventional technique in liver transplantation: report of a randomized trial. Transpl Int 1997; 10(2): 109-12. [http://dx.doi.org/10.1111/j.1432-2277.1997.tb00550.x] [PMID: 9089994] ]). However, no significant difference in the incidence of acute kidney injury was observed between conventional technique groups with and without venovenous bypass [45Grande L, Rimola A, Cugat E, et al. Effect of venovenous bypass on perioperative renal function in liver transplantation: results of a randomized, controlled trial. Hepatology 1996; 23(6): 1418-28. [http://dx.doi.org/10.1002/hep.510230618] [PMID: 8675159] , 46Gurusamy KS, Koti R, Pamecha V, Davidson BR. Veno-venous bypass versus none for liver transplantation. Cochrane Database Syst Rev 2011; (3): CD007712. [http://dx.doi.org/10.1002/14651858.CD007712.pub2] [PMID: 21412907] ]. However, piggyback technique using temporary portocaval shunt produced beneficial effects on renal function (maintenance of urine output during the anhepatic phase and stable postoperative serum creatinine levels) compared to piggyback technique in the absence of temporary portocaval shunt [47Figueras J, Llado L, Ramos E, et al. Temporary portocaval shunt during liver transplantation with vena cava preservation. Results of a prospective randomized study. Liver Transpl 2001; 7(10): 904-11. In summary, the use of hydroethyl starch and chloride-liberal fluids should be avoided whereas fenoldopam, venovenous bypass during total occlusion of the inferior vena cava, and temporary portocaval shunt are renoprotective in liver transplantation. Although central venous pressure gives an estimate of hepatic venous pressure and indirectly reflects portal venous pressure, recommendations have been made to abandon the static preload index due to its unreliability in assessing intravascular volume status [48Shippy CR, Appel PL, Shoemaker WC. Reliability of clinical monitoring to assess blood volume in critically ill patients. Crit Care Med 1984; 12(2): 107-12. [http://dx.doi.org/10.1097/00003246-198402000-00005] [PMID: 6697726] , 49Marik PE, Cavallazzi R. Does the central venous pressure predict fluid responsiveness? An updated meta-analysis and a plea for some common sense. Crit Care Med 2013; 41(7): 1774-81. [http://dx.doi.org/10.1097/CCM.0b013e31828a25fd] [PMID: 23774337] ]. The static preload indices, which also include pulmonary artery occlusion pressure, failed to predict ventricular filling volume, cardiac performance, or hemodynamic response to volume challenge in normal subjects or septic patients [50Kumar A, Anel R, Bunnell E, et al. Pulmonary artery occlusion pressure and central venous pressure fail to predict ventricular filling volume, cardiac performance, or the response to volume infusion in normal subjects. Crit Care Med 2004; 32(3): 691-9. [http://dx.doi.org/10.1097/01.CCM.0000114996.68110.C9] [PMID: 15090949] , 51Osman D, Ridel C, Ray P, et al. Cardiac filling pressures are not appropriate to predict hemodynamic response to volume challenge. Crit Care Med 2007; 35(1): 64-8. [http://dx.doi.org/10.1097/01.CCM.0000249851.94101.4F] [PMID: 17080001] ]. In particular, the incidence of severe ventricular arrhythmia is high during the insertion and removal of a pulmonary catheter in liver transplant recipients [52Gwak MS, Kim JA, Kim GS, et al. Incidence of severe ventricular arrhythmias during pulmonary artery catheterization in liver allograft recipients. Liver Transpl 2007; 13(10): 1451-4. [http://dx.doi.org/10.1002/lt.21300] [PMID: 17902132] ]. Hence, dynamic preload indices, such as systolic pressure variation, pulse pressure variation, and stroke volume variation, which represent the fluctuation of systolic pressure, pulse pressure, and stroke volume, respectively, according to a periodic change in intrathoracic pressure during the respiratory cycle under mechanical ventilation, were developed. These indices can be used to represent intravascular volume status via a Frank-Starling curve. Particularly, stroke volume variation became popular following the introduction of the FloTrac/Vigileo system (Edwards Lifesciences, Irvine, CA, United States). Despite that patients with cirrhosis show altered circulation patterns (increased cardiac output and decreased peripheral vascular resistance) [53Lee RF, Glenn TK, Lee SS. Cardiac dysfunction in cirrhosis. Best Pract Res Clin Gastroenterol 2007; 21(1): 125-40. [http://dx.doi.org/10.1016/j.bpg.2006.06.003] [PMID: 17223501] , 54Milani A, Zaccaria R, Bombardieri G, Gasbarrini A, Pola P. Cirrhotic cardiomyopathy. Dig Liver Dis 2007; 39(6): 507-15. [http://dx.doi.org/10.1016/j.dld.2006.12.014] [PMID: 17383244] ], which may affect the accuracy of estimating vascular compliance and resistance and result in an incorrect calculation of stroke volume when using the FloTrac/Vigileo system, stroke volume variation is still a better predictor of fluid responsiveness compared to central venous pressure and pulmonary artery occlusion pressure [9Shin YH, Ko JS, Gwak MS, Kim GS, Lee JH, Lee SK. Utility of uncalibrated femoral stroke volume variation as a predictor of fluid responsiveness during the anhepatic phase of liver transplantation. Liver Transpl 2011; 17(1): 53-9. [http://dx.doi.org/10.1002/lt.22186] [PMID: 21254345] , 55Biais M, Nouette-Gaulain K, Cottenceau V, Revel P, Sztark F. Uncalibrated pulse contour-derived stroke volume variation predicts fluid responsiveness in mechanically ventilated patients undergoing liver transplantation. Br J Anaesth 2008; 101(6): 761-8. [http://dx.doi.org/10.1093/bja/aen277] [PMID: 18852114] ] and its performance is comparable to pulse pressure variability. In addition, it has a better correlation with right ventricular end-diastolic volume index than central venous pressure or pulmonary artery occlusion pressure [10Su BC, Tsai YF, Cheng CW, et al. Stroke volume variation derived by arterial pulse contour analysis is a good indicator for preload estimation during liver transplantation. Transplant Proc 2012; 44(2): 429-32. [http://dx.doi.org/10.1016/j.transproceed.2011.12.037] [PMID: 22410035] ]. Moreover, stroke volume variation is not influenced by positive end-expiratory pressure [8Biais M, Nouette-Gaulain K, Quinart A, Roullet S, Revel P, Sztark F. Uncalibrated stroke volume variations are able to predict the hemodynamic effects of positive end-expiratory pressure in patients with acute lung injury or acute respiratory distress syndrome after liver transplantation. Anesthesiology 2009; 111(4): 855-62. [http://dx.doi.org/10.1097/ALN.0b013e3181b27fb2] [PMID: 19741498] ] and the type of artery catheterized for its measurement [56Kim YK, Shin WJ, Song JG, et al. Comparison of stroke volume variations derived from radial and femoral arterial pressure waveforms during liver transplantation. Transplant Proc 2009; 41(10): 4220-8. [http://dx.doi.org/10.1016/j.transproceed.2009.09.050] [PMID: 20005373] ]. In contrast, pulse pressure variability was found to be unreliable predictor of fluid responsiveness during orthotopic liver transplantation [57Gouvêa G, Diaz R, Auler L, Toledo R, Martinho JM. Evaluation of the pulse pressure variation index as a predictor of fluid responsiveness during orthotopic liver transplantation. Br J Anaesth 2009; 103(2): 238-43. [http://dx.doi.org/10.1093/bja/aep123] [PMID: 19454548] ]. However, the results of the study are not reliable because the study has some inherent limitations. The amount of fluid (350 ml) used for fluid challenge was not enough to increase the stroke volume index by 10% (the criterion for fluid responsiveness) and the study protocol was completed in only 12 (80%) and 7 (46%) patients out of 15 patients during the anhepatic and neohepatic phases, respectively, resulting in less statistical power. To the best of my knowledge, there is no available study which investigated the utility of systolic pressure variability in liver transplantation. Despite its better performance for fluid management, the use of stroke volume variation did not decrease the incidence of acute kidney injury or of 30-day and 1-year mortality compared to the use of central venous pressure [11Wang SC, Teng WN, Chang KY, et al. Fluid management guided by stroke volume variation failed to decrease the incidence of acute kidney injury, 30-day mortality, and 1-year survival in living donor liver transplant recipients. J Chin Med Assoc 2012; 75(12): 654-9. [10.1016/j.jcma.2012.08.007]. [PMID: 23245482]. [http://dx.doi.org/10.1016/j.jcma.2012.08.007] [PMID: 23245482] ]. In addition, unlike with central venous pressure, assessing intravascular volume status by measuring stroke volume variation was not associated with a postoperative decrease in portal hyperperfusion [7Ryu TH, Jung JY, Choi DL, Han YS, Kim JD, Kim JH. Optimal central venous pressure during the neohepatic phase to decrease peak portal vein flow velocity for the prevention of portal hyperperfusion in patients undergoing living donor liver transplantation. Transplant Proc 2015; 47(4): 1194-8. [http://dx.doi.org/10.1016/j.transproceed.2014.10.071] [PMID: 26036552] ]. Furthermore, the role of stroke volume variation in reducing intraoperative blood loss has not been evaluated. Compared to the year 2002 when only 21% of high-volume centers used transesophageal echocardiography during liver transplantation [58Schumann R. Intraoperative resource utilization in anesthesia for liver transplantation in the United States: a survey. Anesth Analg 2003; 97(1): 21-8. [http://dx.doi.org/10.1213/01.ANE.0000068483.91464.2B] [PMID: 12818937] ], the percentage of the use of transesophageal echocardiography has increased to 86% in 2008 [59Wax DB, Torres A, Scher C, Leibowitz AB. Transesophageal echocardiography utilization in high-volume liver transplantation centers in the United States. J Cardiothorac Vasc Anesth 2008; 22(6): 811-3. [http://dx.doi.org/10.1053/j.jvca.2008.07.007] [PMID: 18834818] ]. It provides visual information about the structural nature, dynamic function, volume status, regional wall motion, and contractility of the heart, pericardial effusion, and embolization of major vessels [60Burtenshaw AJ, Isaac JL. The role of trans-oesophageal echocardiography for perioperative cardiovascular monitoring during orthotopic liver transplantation. Liver Transpl 2006; 12(11): 1577-83. [http://dx.doi.org/10.1002/lt.20929] [PMID: 17058248] ]. In a variety of clinical situations, left ventricular end-diastolic area index, which represents left ventricular filling, was shown to be correlated with stroke volume index (preload) during volume therapy in the absence of the changes in the left ventricular compliance and contractility [61Townend JN, Hutton P. Transoesophageal echocardiography in anaesthesia and intensive care. Br J Anaesth 1996; 77(2): 137-9. [http://dx.doi.org/10.1093/bja/77.2.137] [PMID: 8881612] -63Cheung AT, Savino JS, Weiss SJ, Aukburg SJ, Berlin JA. Echocardiographic and hemodynamic indexes of left ventricular preload in patients with normal and abnormal ventricular function. Anesthesiology 1994; 81(2): 376-87. [http://dx.doi.org/10.1097/00000542-199408000-00016] [PMID: 8053588] ]. However, left ventricular end-diastolic area index was not correlated with stroke volume index in patients undergoing liver transplantation [64Della Rocca G, Costa MG, Coccia C, et al. Continuous right ventricular end-diastolic volume in comparison with left ventricular end-diastolic area. Eur J Anaesthesiol 2009; 26(4): 272-8. [http://dx.doi.org/10.1097/EJA.0b013e328319be8e] [PMID: 19276913] ]. Although its echocardiographic view and planimetry tracing is simple, there are low repeatability and high interindividual variation between operators [63Cheung AT, Savino JS, Weiss SJ, Aukburg SJ, Berlin JA. Echocardiographic and hemodynamic indexes of left ventricular preload in patients with normal and abnormal ventricular function. Anesthesiology 1994; 81(2): 376-87. [http://dx.doi.org/10.1097/00000542-199408000-00016] [PMID: 8053588] ]. In addition, the posterior retraction of the stomach for liver transplantation prevents obtaining an optimal transgastric view [60Burtenshaw AJ, Isaac JL. The role of trans-oesophageal echocardiography for perioperative cardiovascular monitoring during orthotopic liver transplantation. Liver Transpl 2006; 12(11): 1577-83. [http://dx.doi.org/10.1002/lt.20929] [PMID: 17058248] ]. Therefore, the usefulness of left ventricular end-diastolic area index obtained with transesophageal echocardiography for the prediction of fluid responsiveness should be further investigated. Maintaining low central venous pressure, which reflects various hepatic hemodynamic parameters, is useful for reducing intraoperative blood loss during the preanhepatic phase of liver transplantation and during hepatic resection. This relationship holds true despite the differences in hepatic physiology and operative techniques between the two surgeries. However, the renal complications that can potentially result from hypovolemia associated with low central venous pressure must be considered. In addition, low central venous pressure does not guarantee liver graft protection during the neohepatic phase. Manipulation of stroke volume variation produces superior results compared to manipulation of central venous pressure in terms of fluid responsiveness, but it has not been demonstrated to improve clinical outcomes, such as mortality, or to prevent portal hyperperfusion. At present, there is no established protocol for maintaining an appropriate intravascular volume during liver transplantation due to the inherent limitations of previous studies (e.g., small sample size that decreases the statistical power of the studies), which prevents universal extrapolation of the protocol used in the studies. Furthermore, central venous pressure is still recommended to be abandoned [49Marik PE, Cavallazzi R. Does the central venous pressure predict fluid responsiveness? An updated meta-analysis and a plea for some common sense. Crit Care Med 2013; 41(7): 1774-81. [http://dx.doi.org/10.1097/CCM.0b013e31828a25fd] [PMID: 23774337] ]. Therefore, further prospective randomized controlled studies assessing each phase of liver transplantation are warranted to identify the optimal central venous pressure or stroke volume variation levels to minimize intraoperative blood loss, improve transfusion rate, and ameliorate postoperative complications, with an overall aim of maintaining liver graft viability. In conclusion, maintaining a low central venous pressure has beneficial effects in liver transplantation while renal protection should always be accompanied. Huntington JT, Royall NA, Schmidt CR. Minimizing blood loss during hepatectomy: a literature review. J Surg Oncol 2014; 109(2): 81-8. Feng ZY, Xu X, Zhu SM, Bein B, Zheng SS. Effects of low central venous pressure during preanhepatic phase on blood loss and liver and renal function in liver transplantation. World J Surg 2010; 34(8): 1864-73. [10.1007/s00268-010-0544-y]. [PMID: 20372900]. Massicotte L, Beaulieu D, Thibeault L. Con: low central venous pressure during liver transplantation. J Cardiothorac Vasc Anesth 2008; 22(2): 315-7. Massicotte L, Lenis S, Thibeault L, Sassine MP, Seal RF, Roy A. Effect of low central venous pressure and phlebotomy on blood product transfusion requirements during liver transplantations. Liver Transpl 2006; 12(1): 117-23. Schroeder RA, Collins BH, Tuttle-Newhall E, et al. Intraoperative fluid management during orthotopic liver transplantation. J Cardiothorac Vasc Anesth 2004; 18(4): 438-41. Schroeder RA, Kuo PC. Pro: low central venous pressure during liver transplantation not too low. J Cardiothorac Vasc Anesth 2008; 22(2): 311-4. Ryu TH, Jung JY, Choi DL, Han YS, Kim JD, Kim JH. Optimal central venous pressure during the neohepatic phase to decrease peak portal vein flow velocity for the prevention of portal hyperperfusion in patients undergoing living donor liver transplantation. Transplant Proc 2015; 47(4): 1194-8. Biais M, Nouette-Gaulain K, Quinart A, Roullet S, Revel P, Sztark F. Uncalibrated stroke volume variations are able to predict the hemodynamic effects of positive end-expiratory pressure in patients with acute lung injury or acute respiratory distress syndrome after liver transplantation. Anesthesiology 2009; 111(4): 855-62. Shin YH, Ko JS, Gwak MS, Kim GS, Lee JH, Lee SK. Utility of uncalibrated femoral stroke volume variation as a predictor of fluid responsiveness during the anhepatic phase of liver transplantation. Liver Transpl 2011; 17(1): 53-9. Su BC, Tsai YF, Cheng CW, et al. Stroke volume variation derived by arterial pulse contour analysis is a good indicator for preload estimation during liver transplantation. Transplant Proc 2012; 44(2): 429-32. Wang SC, Teng WN, Chang KY, et al. Fluid management guided by stroke volume variation failed to decrease the incidence of acute kidney injury, 30-day mortality, and 1-year survival in living donor liver transplant recipients. J Chin Med Assoc 2012; 75(12): 654-9. [10.1016/j.jcma.2012.08.007]. [PMID: 23245482]. Vesely TM. Central venous catheter tip position: a continuing controversy. J Vasc Interv Radiol 2003; 14(5): 527-34. [PMID: 12761305]. Ommen SR, Nishimura RA, Hurrell DG, Klarich KW. Assessment of right atrial pressure with 2-dimensional and Doppler echocardiography: a simultaneous catheterization and echocardiographic study. Mayo Clin Proc 2000; 75(1): 24-9. [10.4065/75.1.24]. [PMID: 10630753]. Rossall RE, Caldwell RA. Obstruction of inferior vena cava by a persistent eustachian valve in a young adult. J Clin Pathol 1957; 10(1): 40-5. [PMID: 13406072]. Sand L, Rizell M, Houltz E, et al. Effect of patient position and PEEP on hepatic, portal and central venous pressures during liver resection. Acta Anaesthesiol Scand 2011; 55(9): 1106-12. Sainz-Barriga M, Scudeller L, Costa MG, de Hemptinne B, Troisi RI. Lack of a correlation between portal vein flow and pressure: toward a shared interpretation of hemodynamic stress governing inflow modulation in liver transplantation. Liver Transpl 2011; 17(7): 836-48. Laine GA, Hall JT, Laine SH, Granger J. Transsinusoidal fluid dynamics in canine liver during venous hypertension. Circ Res 1979; 45(3): 317-23. Meissner MH, Moneta G, Burnand K, et al. The hemodynamics and diagnosis of venous disease. J Vasc Surg 2007; 46(4S2-4S). Kumar A, Sharma P, Sarin SK. Hepatic venous pressure gradient measurement: time to learn! Indian J Gastroenterol 2008; 27(2): 74-80. Bloom S, Kemp W, Lubel J. Portal hypertension: pathophysiology, diagnosis and management. Intern Med J 2015; 45(1): 16-26. [10.1111/imj.12590]. [PMID: 25230084]. Garcia-Tsao G, Groszmann RJ, Fisher RL, Conn HO, Atterbury CE, Glickman M. Portal pressure, presence of gastroesophageal varices and variceal bleeding. Hepatology 1985; 5(3): 419-24. [PMID: 3873388]. Bauer LA, OSullivan T, Reiss WG, et al. Liver blood flow, antipyrine clearance, and antipyrine metabolite formation clearance in patients with chronic active hepatitis and alcoholic cirrhosis. Br J Clin Pharmacol 1994; 37(4): 375-81. Wei A, Chen H, Liu L, Wang K. Changes in portal vein and hepatic vein blood flow volume and their ratio in SD rats during induced carcinogenesis of hepatocellular carcinoma. Nan Fang Yi Ke Da Xue Xue Bao 2015; 35(3): 442-5. Chen H, Merchant NB, Didolkar MS. Hepatic resection using intermittent vascular inflow occlusion and low central venous pressure anesthesia improves morbidity and mortality. J Gastrointest Surg 2000; 4(2): 162-7. Melendez JA, Arslan V, Fischer ME, et al. Perioperative outcomes of major hepatic resections under low central venous pressure anesthesia: blood loss, blood transfusion, and the risk of postoperative renal dysfunction. J Am Coll Surg 1998; 187(6): 620-5. Jones RM, Moulton CE, Hardy KJ. Central venous pressure and its effect on blood loss during liver resection. Br J Surg 1998; 85(8): 1058-60. Smyrniotis V, Kostopanagiotou G, Theodoraki K, Tsantoulas D, Contis JC. The role of central venous pressure and type of vascular control in blood loss during major liver resections. Am J Surg 2004; 187(3): 398-402. Balci ST, Pirat A, Torgay A, Cinar O, Sevmis S, Arslan G. Effect of restrictive fluid management and acute normovolemic intraoperative hemodilution on transfusion requirements during living donor hepatectomy. Transplant Proc 2008; 40(1): 224-7. Ginès P, Schrier RW. Renal failure in cirrhosis. N Engl J Med 2009; 361(13): 1279-90. Wang B, He HK, Cheng B, Wei K, Min S. Effect of low central venous pressure on postoperative pulmonary complications in patients undergoing liver transplantation. Surg Today 2013; 43(7): 777-81. Vorobioff J, Bredfeldt JE, Groszmann RJ. Increased blood flow through the portal system in cirrhotic rats. Gastroenterology 1984; 87(5): 1120-6. Cywinski JB, Mascha E, You J, et al. Central venous pressure during the post-anhepatic phase is not associated with early postoperative outcomes following orthotopic liver transplantation. Minerva Anestesiol 2010; 76(10): 795-804. Hilmi IA, Damian D, Al-Khafaji A, et al. Acute kidney injury following orthotopic liver transplantation: incidence, risk factors, and effects on patient and graft outcomes. Br J Anaesth 2015; 114(6): 919-26. Cabezuelo JB, Ramírez P, Ríos A, et al. Risk factors of acute renal failure after liver transplantation. Kidney Int 2006; 69(6): 1073-80. Zacharias M, Mugawar M, Herbison GP, et al. Interventions for protecting renal function in the perioperative period. Cochrane Database Syst Rev 2013; (9): CD003590. Della RG, Pompei L, Costa MG, et al. Fenoldopam mesylate and renal function in patients undergoing liver transplantation: A randomized, controlled pilot trial. Anesth Analg 2004; 99(6): 1604-9. Biancofiore G, Della RG, Bindi L, et al. Use of fenoldopam to control renal dysfunction early after liver transplantation. Liver Transpl 2004; 10(8): 986-92. Hilmi IA, Peng Z, Planinsic RM, et al. N-acetylcysteine does not prevent hepatorenal ischaemia-reperfusion injury in patients undergoing orthotopic liver transplantation. Nephrol Dial Transplant 2010; 25(7): 2328-33. Mukhtar A, Aboulfetouh F, Obayah G, et al. The safety of modern hydroxyethyl starch in living donor liver transplantation: A comparison with human albumin. Anesth Analg 2009; 109(3): 924-30. Hand WR, Whiteley JR, Epperson TI, et al. Hydroxyethyl starch and acute kidney injury in orthotopic liver transplantation: a single-center retrospective review. Anesth Analg 2015; 120(3): 619-26. Pillebout E, Nochy D, Hill G, et al. Renal histopathological lesions after orthotopic liver transplantation (OLT). Am J Transplant 2005; 5(5): 1120-9. Nadeem A, Salahuddin N, El Hazmi A, et al. Chloride-liberal fluids are associated with acute kidney injury after liver transplantation. Crit Care 2014; 18(6): 625. Niemann CU, Walia A, Waldman J, et al. Acute kidney injury during liver transplantation as determined by neutrophil gelatinase-associated lipocalin. Liver Transpl 2009; 15(12): 1852-60. Jovine E, Mazziotti A, Grazi GL, et al. Piggy-back versus conventional technique in liver transplantation: report of a randomized trial. Transpl Int 1997; 10(2): 109-12. Grande L, Rimola A, Cugat E, et al. Effect of venovenous bypass on perioperative renal function in liver transplantation: results of a randomized, controlled trial. Hepatology 1996; 23(6): 1418-28. Gurusamy KS, Koti R, Pamecha V, Davidson BR. Veno-venous bypass versus none for liver transplantation. Cochrane Database Syst Rev 2011; (3): CD007712. Figueras J, Llado L, Ramos E, et al. Temporary portocaval shunt during liver transplantation with vena cava preservation. Results of a prospective randomized study. Liver Transpl 2001; 7(10): 904-11. Shippy CR, Appel PL, Shoemaker WC. Reliability of clinical monitoring to assess blood volume in critically ill patients. Crit Care Med 1984; 12(2): 107-12. Marik PE, Cavallazzi R. Does the central venous pressure predict fluid responsiveness? An updated meta-analysis and a plea for some common sense. Crit Care Med 2013; 41(7): 1774-81. Kumar A, Anel R, Bunnell E, et al. Pulmonary artery occlusion pressure and central venous pressure fail to predict ventricular filling volume, cardiac performance, or the response to volume infusion in normal subjects. Crit Care Med 2004; 32(3): 691-9. Osman D, Ridel C, Ray P, et al. Cardiac filling pressures are not appropriate to predict hemodynamic response to volume challenge. Crit Care Med 2007; 35(1): 64-8. Gwak MS, Kim JA, Kim GS, et al. Incidence of severe ventricular arrhythmias during pulmonary artery catheterization in liver allograft recipients. Liver Transpl 2007; 13(10): 1451-4. Lee RF, Glenn TK, Lee SS. Cardiac dysfunction in cirrhosis. Best Pract Res Clin Gastroenterol 2007; 21(1): 125-40. Milani A, Zaccaria R, Bombardieri G, Gasbarrini A, Pola P. Cirrhotic cardiomyopathy. Dig Liver Dis 2007; 39(6): 507-15. Biais M, Nouette-Gaulain K, Cottenceau V, Revel P, Sztark F. Uncalibrated pulse contour-derived stroke volume variation predicts fluid responsiveness in mechanically ventilated patients undergoing liver transplantation. Br J Anaesth 2008; 101(6): 761-8. Kim YK, Shin WJ, Song JG, et al. Comparison of stroke volume variations derived from radial and femoral arterial pressure waveforms during liver transplantation. Transplant Proc 2009; 41(10): 4220-8. Gouvêa G, Diaz R, Auler L, Toledo R, Martinho JM. Evaluation of the pulse pressure variation index as a predictor of fluid responsiveness during orthotopic liver transplantation. Br J Anaesth 2009; 103(2): 238-43. Schumann R. Intraoperative resource utilization in anesthesia for liver transplantation in the United States: a survey. Anesth Analg 2003; 97(1): 21-8. Wax DB, Torres A, Scher C, Leibowitz AB. Transesophageal echocardiography utilization in high-volume liver transplantation centers in the United States. J Cardiothorac Vasc Anesth 2008; 22(6): 811-3. Burtenshaw AJ, Isaac JL. The role of trans-oesophageal echocardiography for perioperative cardiovascular monitoring during orthotopic liver transplantation. Liver Transpl 2006; 12(11): 1577-83. Townend JN, Hutton P. Transoesophageal echocardiography in anaesthesia and intensive care. Br J Anaesth 1996; 77(2): 137-9. Denault AY, Couture P, McKenty S, et al. Perioperative use of transesophageal echocardiography by anesthesiologists: impact in noncardiac surgery and in the intensive care unit. Can J Anaesth 2002; 49(3): 287-93. Cheung AT, Savino JS, Weiss SJ, Aukburg SJ, Berlin JA. Echocardiographic and hemodynamic indexes of left ventricular preload in patients with normal and abnormal ventricular function. Anesthesiology 1994; 81(2): 376-87. Della Rocca G, Costa MG, Coccia C, et al. Continuous right ventricular end-diastolic volume in comparison with left ventricular end-diastolic area. Eur J Anaesthesiol 2009; 26(4): 272-8. Crawford JM, Burt AD. Anatomy, pathophysiology and basic mechanisms of disease. In: Burt AD, Portmann BC, Ferrell LD, Eds. MacSween's Pathology of the Liver. Philadelphia: Churchill Livingstone Elsevier 2012; pp. 1-77.